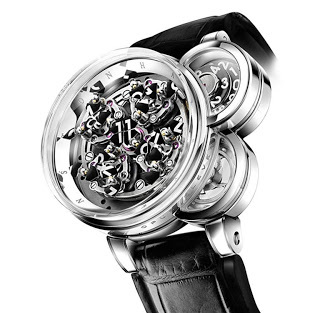 Harry Winston just unveiled the Opus Eleven (why not 11 or XI? 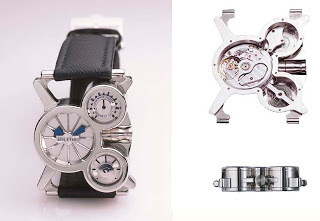 ), which looks to be the coolest instalment in this series since the Opus V. Created together with Denis Giguet of MCT, who incidentally is an alumnus of Rolex and Harry Winston, the Opus 11 is easy to understand. The action takes place at the top of the hour, when the hour digit in the centre breaks apart into its four constituent discs, and the next hour is assembled in the centre by another four discs. There are 24 discs in total that revolve around the case – four satellites holding six discs each. Since the Opus 6 I found the Opi (or Opuses or Opera?) rather lacklustre. The Opus Eleven turns it around completely. Bravo! 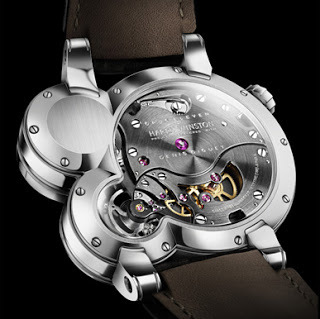 On another note, the new Opus Eleven reminds me of the Vianney Halter Goldpfeil Satellarium with its “hidden Mickey”. Update: This video illustrates how the Opus Eleven functions.